There’s no doubt that there has been a noticeable movement towards adopting a healthier diet, with many ditching the standard cornflakes and cow’s milk, in favour of a bowl of Zoats made with almond milk (Porridge made from oats and Zucchini- or if you’re British- Courgette); or the Acai bowl lavished in super-food powders, seeds and nut-butters. The number of Brits changing their eating habits and transitioning to the vegan lifestyle has risen by 360% in the last 10 years! For many, avoiding all animal based products is near on impossible, as this entails missing out on every day essentials such as: milk, eggs and even honey! But is this shift due to the popularity of wanting to be healthier and look leaner, or are Animals Welfare Rights at the centre of this trend? Of course, the consumption of animal based products is only one issue of many within the Animal Welfare community, with many protesting against animals being farmed in unethical conditions, as well as being used for cosmetic & pharmaceutical testing, entertainment and garments. In addition to this, with some pets, such as the Pug, increasing in popularity and becoming must have fashion accessories, there’s been a rise in illegal, cruel mass breeding. The specific issues that each influencer holds closest to their heart will differ from one person to the next, but what stays the same amongst the community if their advocacy and passion for the protection of animal rights. We have conducted some research and analysis across Social Media to identify the top 100 influencers and brands in this space. We have then mapped this community to see who is engaging with who and what they’re talking about. We got in contact with some of the biggest Animal Welfare advocates to understand their stance on the topic and any predictions they hold for the future of the movement. We have included quotes from: Lisa Marie (#1); Dmitry Lysenko (11); Marc Abraham (#12) and Michelle Wells (#19). Because they are viewed as commodities and not sentient individuals, the existence of billions of non-human animals is pre-destined to be something out of our worst nightmares. It is often said to make a point about non-human animal use; ‘animals are not objects.’ The heartbreaking fact is, these commodified individuals are not even treated as well as inanimate objects. With objects, humans recognise fragility, give them special care, and even protect them from elements and certainly harm. Non-human animals are treated so horrifically, there is no comparison that even equates. Each time we pay for anything that is the result of non-human animal objectification, we are the perpetrator of this unspeakable condition. This brutality tragically is all about dollars, and the driving force; a simple equation: supply and demand. The good news is, the consumer has all of the power to correct it by simply removing their demand. This is why veganism is creating such a positive trend for animals. Remove the demand for products created by cruelty and killing, and it stops. In purchasing vegan products and services, one individual saves hundreds of lives per year. This ripple created by vegans is having a positive impact today and it is set to grow exponentially into the future. I believe in “animal liberation.” This means helping create a world where animals are not used for human ends such as food, clothing, entertainment, sacrifices or other uses. My efforts on social media are directed to challenging animal cruelty; I focus on animal sacrifices and factory farming. I regularly tweet against cruel factory farm practices such as PAC (piglets are smashed on concrete to “euthanize” them on factory farms) and sacrifices of animals (see hashtag Khokana as an example). Animal welfare is for everyone who cares about animals to get involved with; and there are so many ways, often costing nothing, that we can help change animals’ lives for the better. From directly lobbying politicians and lawmakers to helping raise awareness on social media; often more effective at changing human behaviour than waiting for new laws to arrive and/or be effectively enforced. Whether it’s signing a petition to end puppy farming; sharing an image that’ll make a holidaymaker think twice about riding that elephant; or even challenging, shaming, or exposing brands or organisations for encouraging/promoting, or even appearing complicit in animal cruelty- we all have the power and resources to make a difference. Quite simply the more we work together, the greater the collective noise we make and the quicker this change will come. So if like me you’re passionate about animal welfare, then please keep campaigning, signing, sharing, shaming, exposing and challenging. Be proud of being the difference these poor animals desperately need, to protect and rescue them from lives of abuse, exploitation, fear, torture or even death, so they can finally enjoy a better life not just today – but well into the future. I have been concerned about the growing acceptance of cruelty & lack of empathy towards animals in society, which is particularly worrying in children. I have noticed that humans are less connected to nature and how our food is farmed and harvested. My endeavour is to install the connectivity, care and respect for all living things. Living cruelty free is a growing movement thanks to advocates. As we are now a global village, we, the advocates are cognisant of animal rights issues around the world. Petitioning for change in countries where cruelty and torture is accepted is a core focus. Live export, Dog meat festivals in China, Vietnam, South Korea are important issues which require governmental and political evolution. We will not give up… Animal advocates are empathetic and passionate. We know each other without ever meeting, we are from every country on Earth. We use a social platform for serious issues, and we are making a difference! 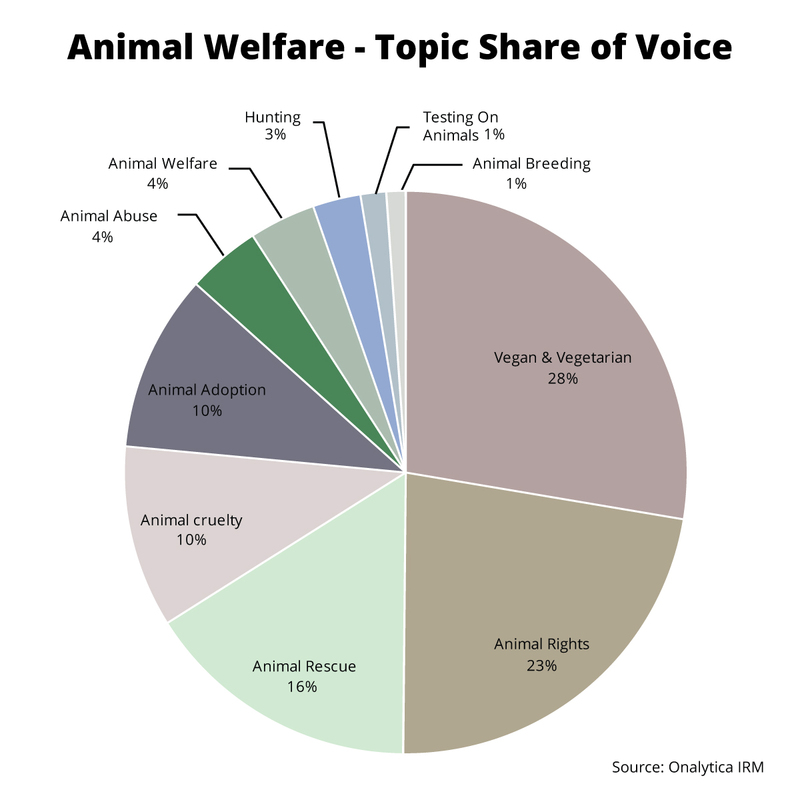 We were interested in seeing which topics were most popular among the top animal welfare influencers, so we analysed their tweets and blogs from 1st January – 15th August 2016 and counted mentions of various topics associated with animal welfare, which we then used to create a topic share of voice chart. It’s interesting to note that the most popular topic among the Animal Welfare Influencers was Vegan & Vegetarian with a 28% share of voice, followed closely by Animal Rights, with a 23% share of voice. Next in popularity was Animal Rescue with a 16% share of voice; Animal Cruelty and Animal Adoption have an equal share of 10%; the overarching theme of Animal Welfare and Animal Abuse also have the same share of 4%; this is closely followed by Hunting with 3% and lastly Testing on Animals and Animal Breeding at 1%. The theme amongst these topics, is that the majority of the community focus on the obvious issues such as animal rights and rescue, whilst a smaller portion of the community focus on more specific topics that are often forgotten such as animal adoption, testing on animals and animal breeding. 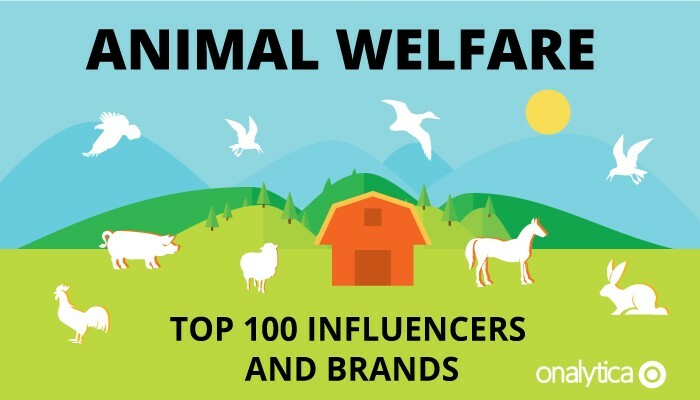 We were very interested in seeing which animal welfare influencers and brands were leading the online discussion, so we analysed tweets over the last 6 months mentioning the keywords: “animal welfare” OR animalwelfare OR “animal rights” OR animalrights OR animalresure OR “animal rescue”. We then identified the top 100 most influential brands and individuals leading the discussion on Twitter. The community was very engaged- as you’d expect amongst advocates of an ethical issue. The below map is centered around #12 Influencer, Marc Abraham. As you can see, he is very engaged with the community, which is perhaps due to him actually being, unlike many, a professional in this field, as well as an advocate. This map was created with our Influencer Relationship Management software (IRM). To see the details of the interactions, click on the map to open up a full version. 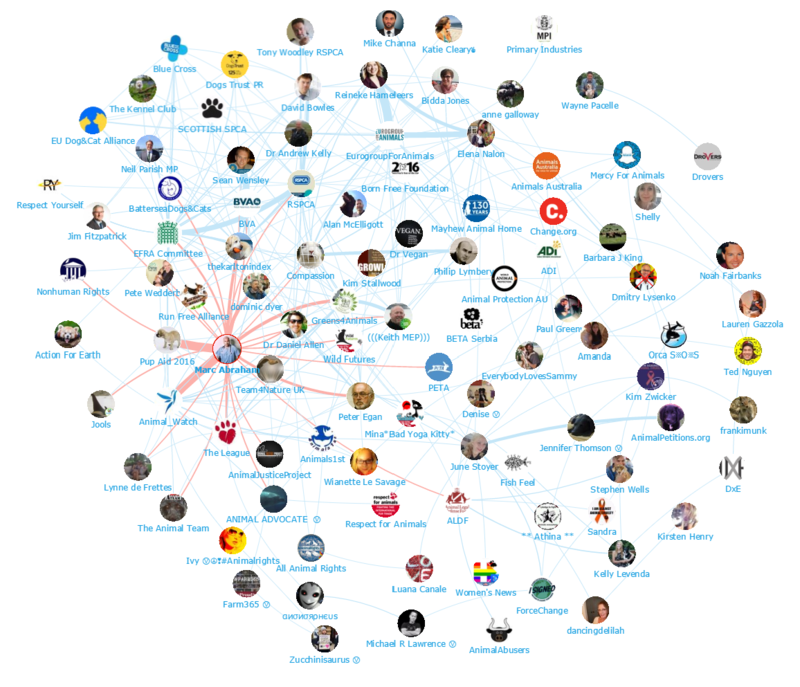 Below you can see another network map created with our Influencer Relationship Management software (IRM) showing the #4 brand RSPCA at the centre and all the conversations to and from the influencers in their field. Despite not being #1, they’re actually far more engaged with the community on Twitter compared to #1 PETA; a well respected and powerful brand on animal welfare, focusing more on broadcasting headline news and protests in this space. The RSPCA on the other hand engage in 1:1 conversations, albeit mainly with other brands in the community, such as the Blue Bross and EFRA Community. When they do engage with individuals, they’re professionals with impact in this field. If you’re interested in identifying and mapping your community, click here to get in touch! 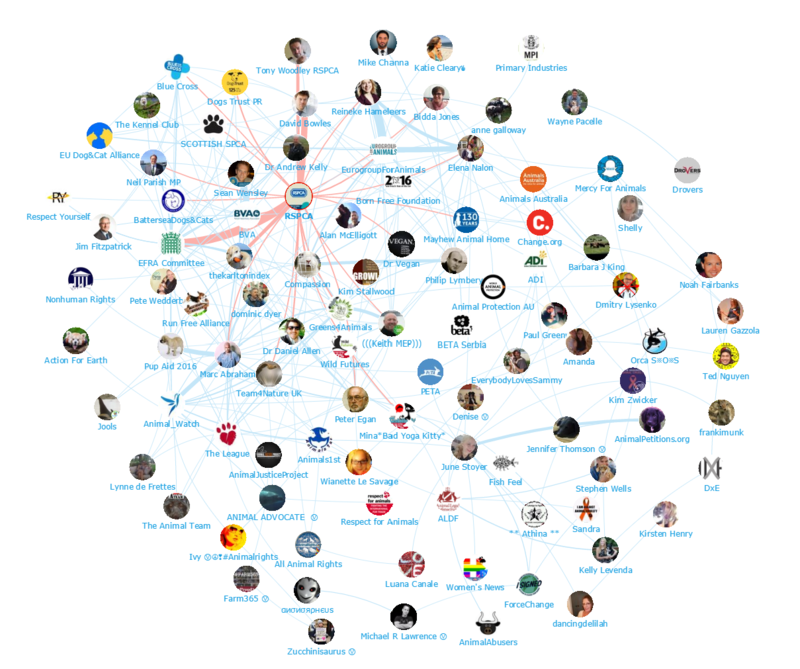 We looked at all the individuals engaging on Twitter to bring you a list of the top influencers in Animal Welfare. Below is the top 50, if you want to see who ranks from 50-100 be sure to download the full report by clicking the download button below. Disclaimer: As ever with these lists, it must be stressed that the ranking is by no means a definitive measurement of influence, as there is no such thing. The brands and individuals listed are undoubtedly influential when it comes to driving discussion around M2M.